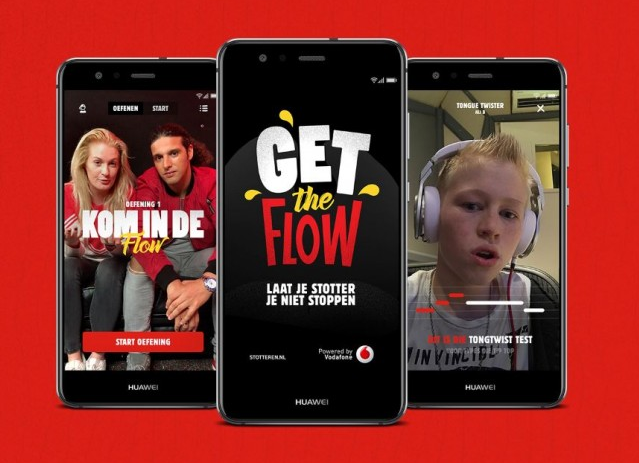 Vodafone, in collaboration with DDB & Tribal Amsterdam, the Dutch Stuttering Federation (NFS) and stutter ambassador singer Sanne Hans, has developed an app called ‘Get The Flow’ that helps children to speak more fluently by using specially created rap exercises. •	Campaign generated earned media value of €5.3m and reached 66% of the Dutch population. •	Two out of three children in The Netherlands who stutter used the app, and it is now used as an official stutter therapy. 5% of all Dutch children stutter, and as a result, many of them become victims of bullying. This causes low self-esteem. Therefore, they choose to communicate via their mobile phone, rather than practise their speech in public. When Vodafone asked DDB & Tribal to create a ‘Powerful Connections’ campaign to convince people that mobile technology connects people and can make a positive difference to their lives. DDB & Tribal were keen to prove that mobile technology really can make a difference by giving children who stutter a chance to practise their speech in a fun but effective way – through rap. The app allows users to connect with other children who stutter, practise together and share their tracks, boosting their confidence in the process. The agency collaborated with famous Dutch rappers, singer songwriter Miss Montreal (who stutters herself) and the Dutch Stutter Federation. The rappers wrote special rap lyrics for every exercise, using tongue twisters and alliterations, especially hard to pronounce for children who stutter. A custom-built timing system automatically detects when the child does not stutter. And the app also allows them to monitor their improvements throughout. Visually the app is inspired by the period when hip hop began to develop: the 1970s in the Bronx, NY. Using primary colors, graffiti typography and hand-drawn illustrations, giving children a cool hip hop experience, throwing in some fun, bold animations too. VODAFONE | GET THE FLOW from Jef Richaerts on Vimeo. The campaign, consisting of a launch event, a social video and a social media campaign, generated an earned media value of €5.3m and reached 66% of the Dutch population. It has given people a positive feeling towards mobile technology and the Vodafone brand. Two out of three children in The Netherlands who stutter have used and loved the app, and it is now used as an official stutter therapy. All of this makes the Get The Flow campaign Vodafone’s most successful ‘Powerful Connections’ campaign to date, winning several major awards along the way, including: Cannes Lions’ Bronze for Media, PR, Entertainment for Music and Sound Design, a Eurobest Silver for Entertainment and Gold for Healthcare/PR, 4x bronze and the grand prix in Healthcare Promo & Activation and the FWA Site of the Day.